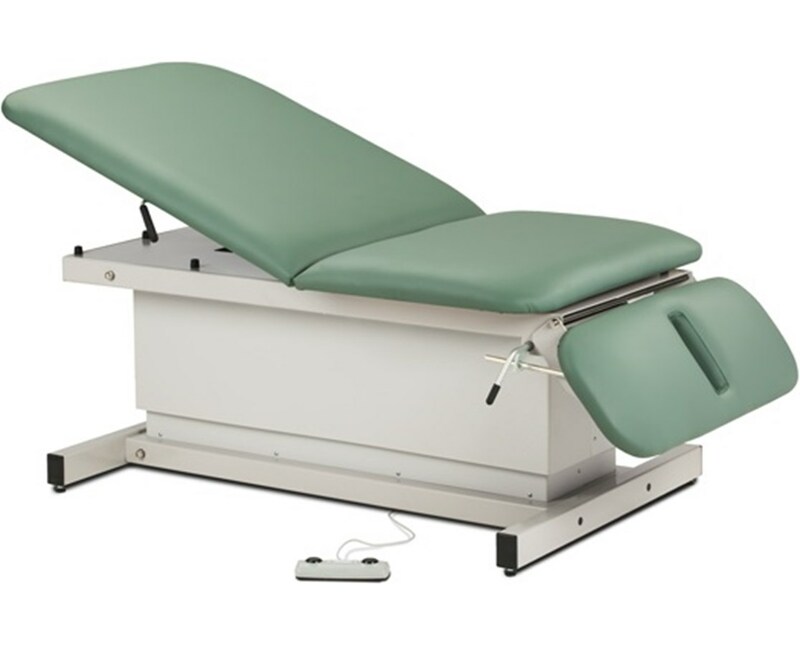 The Clinton Shrouded Extra Wide Bariatric Power Table with Adjustable Brackrest & Drop Section offers ultra strong construction and a user-friendly mechanism. This power table features an enclosed base for enhanced and simple cleaning. The easy-clean ABS plastic shroud encases the durable scissor lift mechanisms and protects the lift mechanisms from acquiring damage over time. 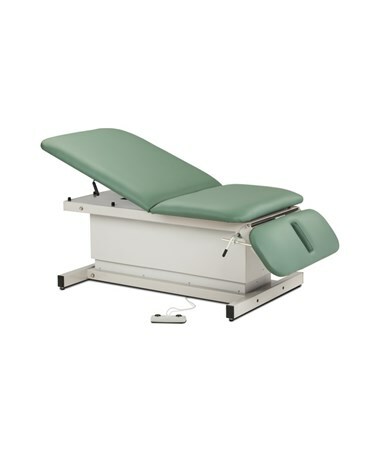 Table Features: The Extra Wide Bariatric Power Table with Adjustable Backrest & Drop Section is an extra wide bariatric model with a choice of two widths. The table features a dual-cylinder, pneumatic backrest that is adjustable from either side and raises 80 degrees from a flat surface. The drop section includes a nosehole* and is also adjustable from either side. The drop section raises 80 degrees from a flat surface. Comfortable: A comfortable seamless upholstered top provides 2" of ultra-firm padding and rounded corners. Table Mechanism: The Clinton Power Table offers a smooth 110 volt electric power height adjustment, a hands free low voltage foot control, and a heavy duty, all welded, lift mechanism. Self contained electrical components provide easy service. Self-lubricating pivot points are included. The power supply and motor meets the UL 60601-1 and CAN/CSA C22.2 601.1. Table Frame: Clinton produces an ultra-strong, uni-frame base with top construction. The durable gray powder-coated steel frame is guaranteed to offer you years of service. This table's low height may help achieve an ADA tax credit. Options: This Power Table is available in 21 attractive colors with a variety of table options. Please review your choices below and select your preference by clicking on the Customize icon above. *Chair may be purchased without a nosehole. Please specify when ordering. Table Height 21" – 34"